Post the coolers that have made you go "wtf". Hopefully this thread goes somewhere because I'd like to see what you can come up with. I hadn't noticed that thread, but it looks interesting. I'm dying to see what tops that. I'm surprised they haven't named their other coolers Richard and Marie. I see the pictures fine. I can see the image yet other users can not. I can't see master invaders either. Yeah, I'll bet you can, guys. I think I know what's happening: The site is hitting a flood limit on direct linking to pictures. At the moment, I can see Widjaja's pic, but not MasterInvader's. Many sites apply such a bandwidth limit to prevent all their bandwidth being sucked up. I recommend hosting the pictures on www.techpowerup.org, Photobucket or whatever to get around this problem. I can see your images. i think i still have an aero7 kicking about!!! 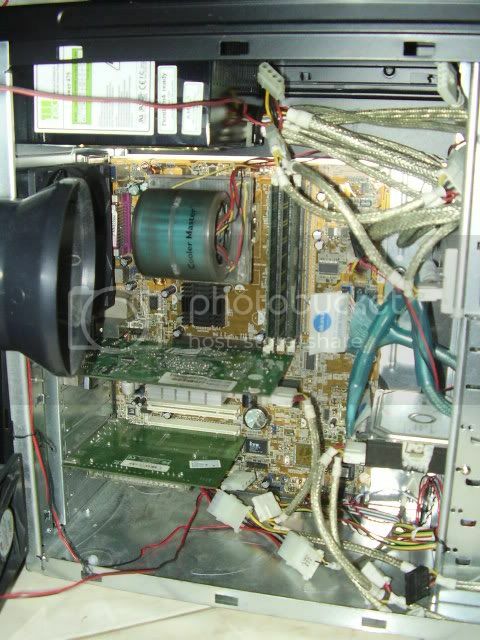 it was on an athlon 1700 jiuhb chip i was running a few years ago!!! Bloody good stepping those chips! Wasn't a bad cooler actually. A little noisy on the top speed setting but otherwise pretty solid!!! I still have one of these as well! Thermaltake Big typhoon. It's strapped to a 939 X2 athlon on an Nforece3 agp motherboard, with a x1950pro. It weights something ridiculous like 900g's. I suppose these to are considered unusual to a degree but since I own one, it seems pretty normal. Tuniq Tower 120 and Extreme. That's the biggest cooler I've ever seen! Do you have the brand and model, I've gotta know more about it. It looks like it's made of aluminium, which I'm not surprised about, due to the weight. The post below that one by a111087 says "Nofen CR-100A"
I didn't expect this thread to have this kind of response! Awesome! You guys have come up with some seriously "WTF" stuff. ohh i forgot about this one! the thermalright 120 copper may not seem all that WTF... but it's made out of nothing but copper. And weights 1.9kgs. That's insane weight!! !